Ryan Keberle & Catharsis album "Find the Common, Shine a Light"
With Find the Common, Shine a Light, trombonist Ryan Keberle has now issued three albums in five years with his piano-less ensemble Catharsis, each one a thoughtfully conceptual disc boasting Keberle’s superb arrangements. But this latest Catharsis outing sacrifices the prominence of the group’s musical virtues for topical social commentary. The purpose here is to protest the election of Donald Trump, and, via music, set forth a psychological blueprint for resisting the advancement of his policies. It begins auspiciously: “Become the Water” is beautifully scored as a soft, billowing anthem reminiscent of Keberle’s mentor Maria Schneider, blending the consciousness theme of Keberle’s past few discs with gentle cheerleading for resistance as vocalist Camila Meza intones the album’s title refrain. “Al Otro Lado del Rio” (“Across the River”), by Uruguayan composer Jorge Drexler, continues the water theme, features the distinctive horn voicings of Keberle and trumpeter Mike Rodriguez, and recalls the emphasis on relatively obscure South American music that burnished last year’s Catharsis disc, Azul Infinito. The rest of Find the Common is hardly a failure—Keberle doesn’t create bad music. 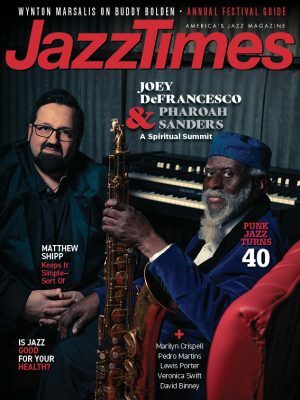 But it’s almost entirely composed of overly familiar cover songs, like the Beatles’ “The Fool on the Hill” and Bob Dylan’s “The Times They Are A-Changin’,” mixed with short pieces, entitled “Empathy,” “Mindfulness” and “Strength,” that are too long to be mere interludes and too weighty to be tone poems, yet lack the full arc of typical Catharsis songs. Yes, Keberle loves his Beatles catalog, but compare “Mother Nature’s Son” by his double quartet with his “The Fool on the Hill,” which is too close for comfort to Sérgio Mendes’ classic rendition. Next time, here’s hoping for more wordless vocals instead of lyrics from Meza, more acoustic rather than electric bass from Jorge Roeder, and more preaching to the choir that shares Keberle’s love of innovative sonority as much as his politics. His bold, inventive arrangements are themselves incisive rebuttals to the autocracy in the White House. 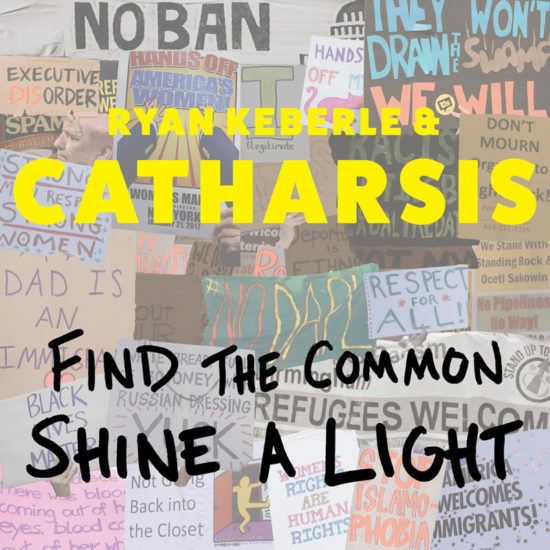 Preview, buy or download songs from the album Find the Common, Shine a Light by Ryan Keberle & Catharsis on iTunes.